Tablets are getting bigger. Several rumors have now detailed Apple's intention on getting into the giant tab game with the iPad Pro, and over the weekend, several websites reported that Apple could also be debuting its first stylus. 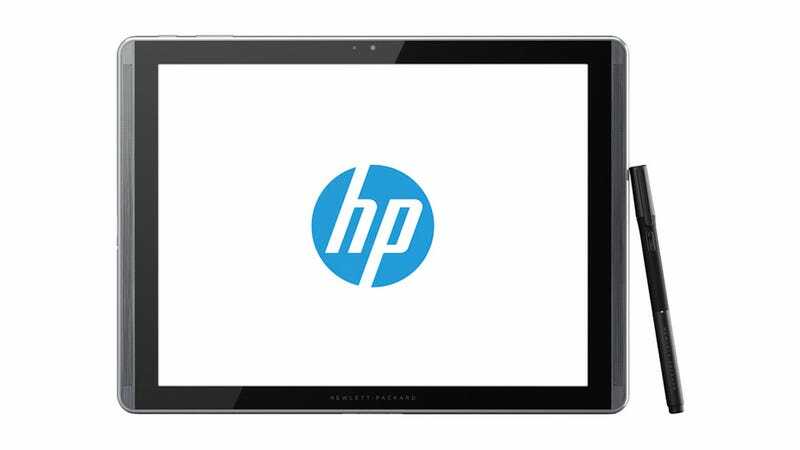 Today, HP's newly announced tablets are hoping to stay ahead of Cupertino's plans. Today, HP announced a number of new tablets, but the most striking one is the new Pro Slate family, which seem to be just a really, really big HTC One (M8). The tablet comes in 8-inch and a massive 12-inch (12.3 actually) tablet as well. But it also comes with what HP calls the Duet Pen, essentially a stylus that can write on anything. That's because it's the first to use the Qualcomm Snapdragon digital pen tech that can write on a tablet and plain old paper, meaning whatever you write on paper automatically appears on the tablet. HP says it's part of the companies "Blended Reality" ecosystem, which launched last year with HP's projector/desktop hybrid, the Sprout. The two tablets have more going for them than just size difference and a fancy new pen. The smaller version, actually at 7.9 inches, has a 2048x1536 resolution, which is relatively comparable to most other tabs out there. However, the big brother is worse off with only a 1600x1200 resolution. Thats a pixel density of only 162 ppi. Not exactly sure why HP decided to go with lower resolution on a much larger screen. Other than that, these tabs run on Snapdragon 800 processors and 2GB of RAM and will be one of the first devices with Corning Gorilla Glass 4. These new tabs will retail for $449 and $569 respectively. But HP isn't just keeping its eye on Apple. Today, the company also announced the Elite x2 1011 G1. This alphabet soup of a name is actually a tablet/ultrabook hybrid, similar to Microsoft's Surface. This 11-inch tab will be powered by different Core M processors (you choose), a new Broadwell family meant to push performance in tablets and hybrids and also let manufacturers create incredibly thin devices. So as a laptop it might be a little underpowered, but as a tablet it will be better than most. The Elite will be available in late January for $900.